CARBONDALE, Ill. — Providing a new twist to a long tradition, seven students in the College of Mass Communication and Media Arts’ graduate program will give their perspectives to a variety of international films this semester. “Film Fridays,” presented by the Department of Cinema and Photography, will feature seven free films beginning Feb. 8. The film screenings all start at 4 p.m. and will be shown in a new venue this semester, French Auditorium in Lindegren Hall. “This may be a first in that graduate students are serving as film curators – selecting the film, discussing it with the audience and then leading a Q&A after the film,” H.D. Motyl, department chair, said. Film Fridays’ history goes back to when film prints were screened, but this is the first time MCMA graduate students have programmed the entire series. Motyl noted the selections are “favorite films of these students” so there is an investment for the students in how audiences look at the films. Feb. 8 – “Omar,” Palestine, 2013, directed by Hany Abu-Assad; presented by Justin Zarian, doctoral candidate. Feb. 15 – “Dangal,” India, 2016, directed by Nitesh Tiwari; presented by Diksha Mittal, doctoral candidate. March 22 – “Mur Murs,” France, 1981, directed by Agnès Varda; presented by Sam Smucker, master’s candidate. March 29 – “October 1,” Nigeria, 2014, directed by Kunle Afolayan; presented by Abimola Iyun, doctoral candidate. April 12 – “Tony Manero,” Chile, 2008, directed by Pablo Larrain; presented by Soumik Pal, doctoral candidate. April 19 – “Born In Flames,” United States, 1983, directed by Lizzie Borden; presented by Katie Hinders, master’s candidate. April 26 – “Halloween: The Curse of Michael Myers (The Producer’s Cut),” United States, 1995/2015, directed by Joe Chappelle; presented by Khara Lukancic, doctoral candidate. For more information, contact mediaarts@siu.edu or Motyl at hdmotyl@siu.edu. 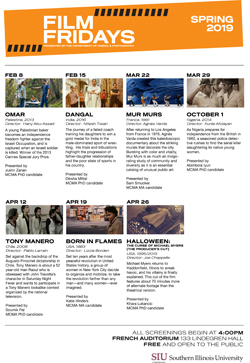 Films presented by College of Mass Communication and Media Arts graduate students during the spring 2019 semester. Films begin at 4 p.m., 133 Lindegren Hall, French Auditorium.